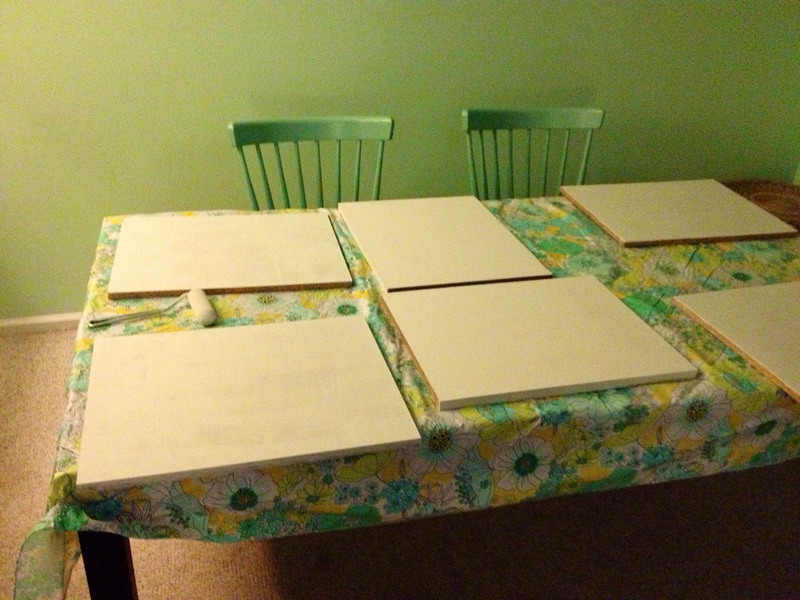 This is kind of random order, but let’s see, I finished painting everything I already built. 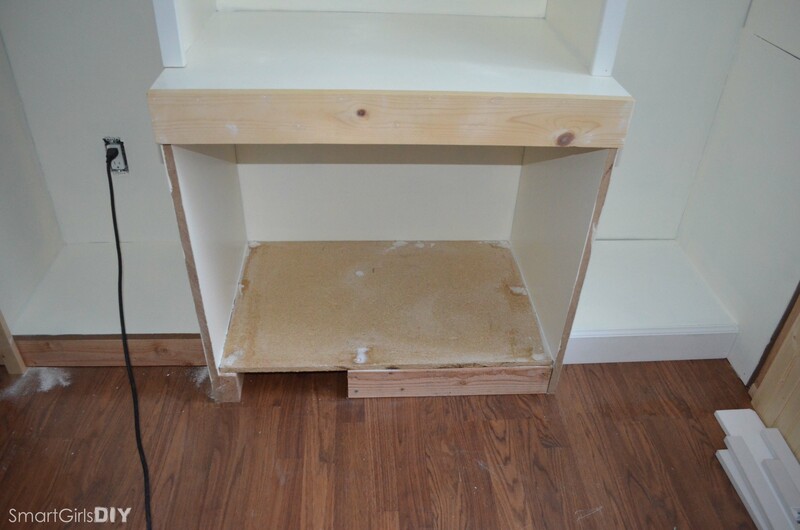 Then I added trim to the sides of the middle section and I added a piece of (nice scrap) wood to the front. 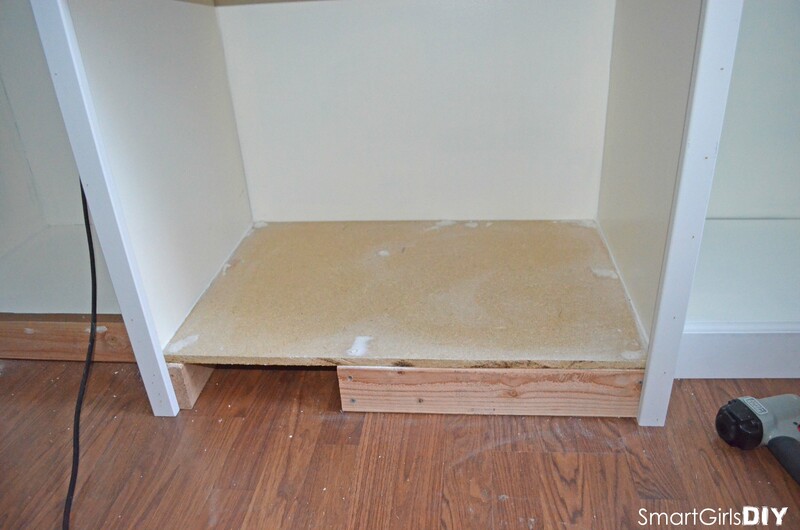 I also covered the framework for the venting and created a bottom shelf, which will be behind closed doors. Things were starting to come together. Vertical trim was added to the corner section. 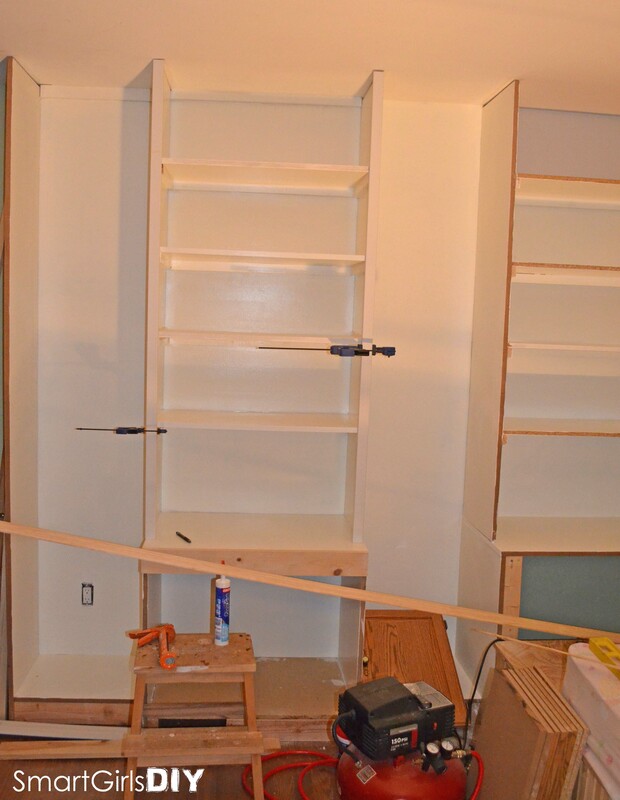 Trim still needed on the front of each shelf and across the top. 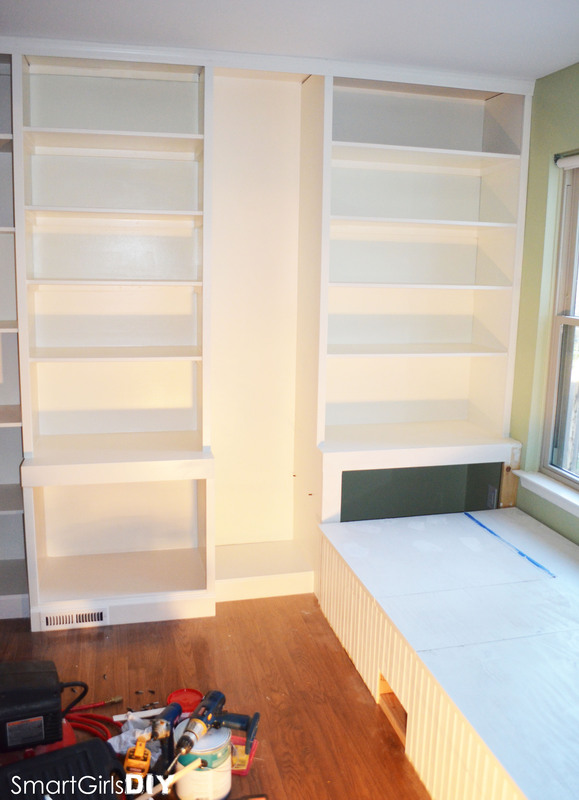 and all the trim was really starting to make the wall unit look presentable. More vertical trim down below. 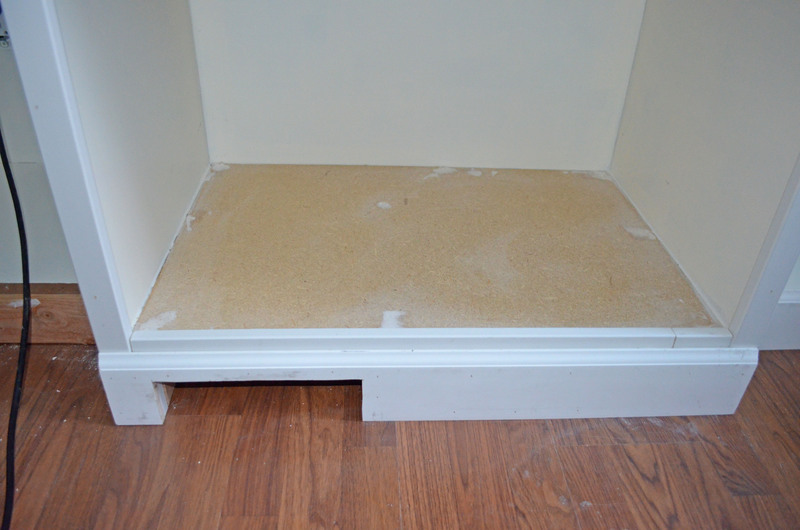 Well, things were looking good until it came time to add the base molding here, oops, that’s a big gap! 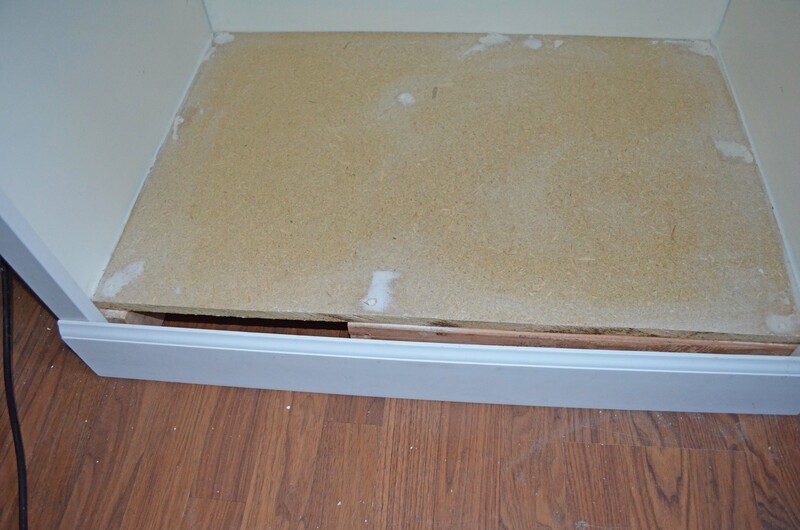 I also had to measure where to cut the hole for the vent. 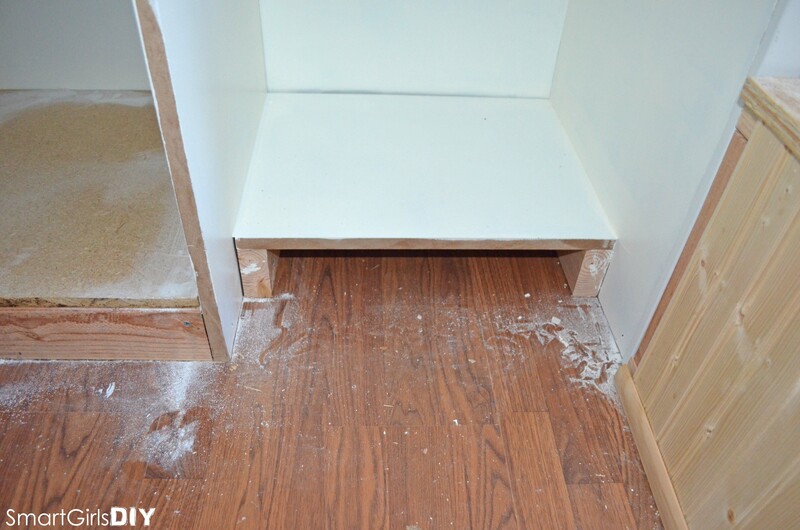 So I added a piece of trim to the gap (and later caulk) and built out the lower portion so I would have something to attach the baseboard to. 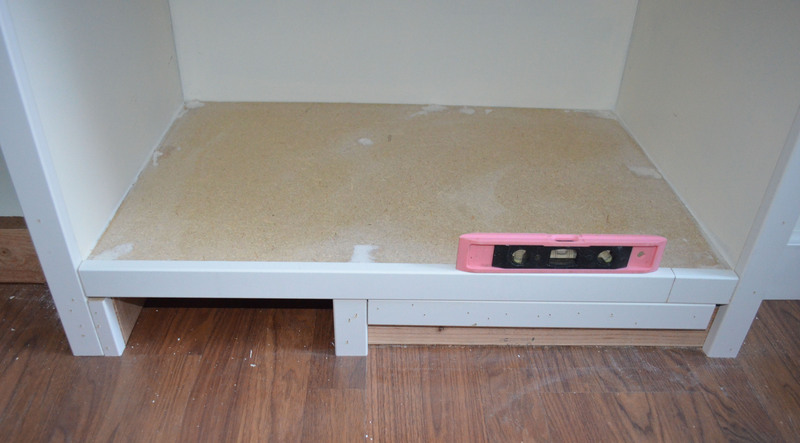 Then I glued and nailed the baseboard in place. It was functional, but still ugly. 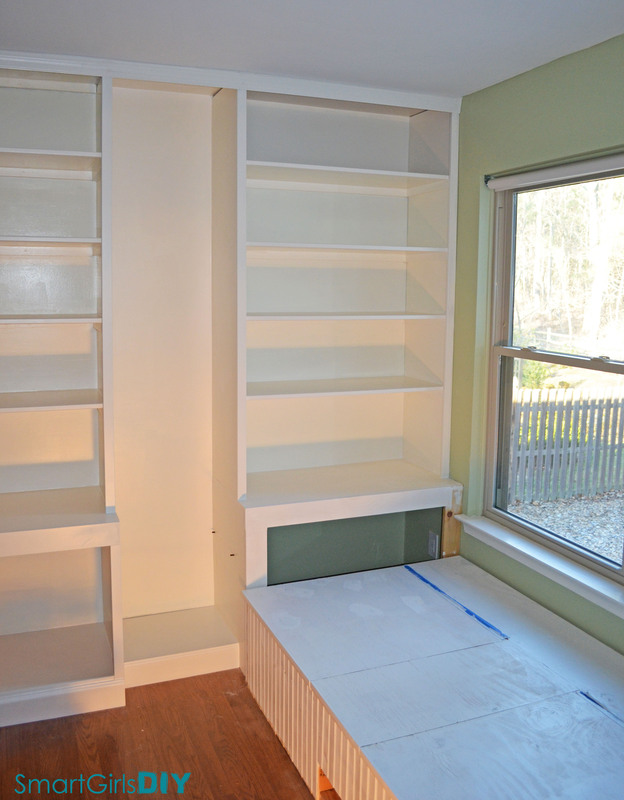 And it looked damn good after lots of caulk, spackle, sanding and paint! 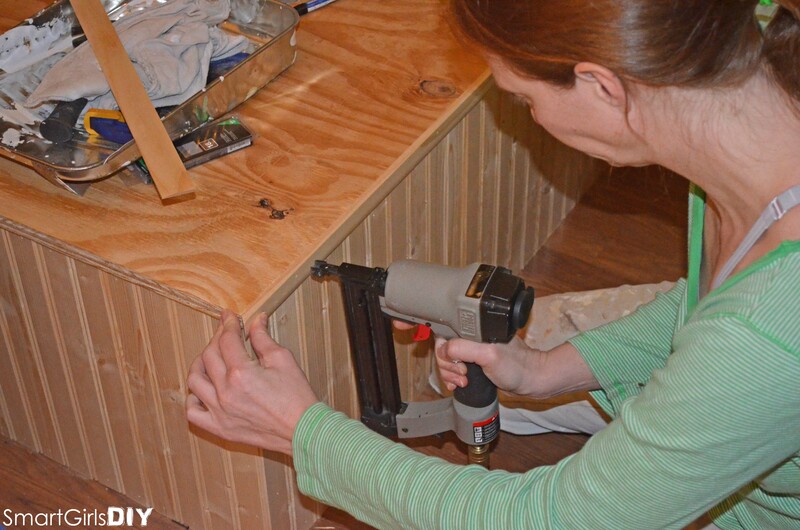 Now that the vent was extended through the base of the cabinet, it was time to attach a new vent cover. 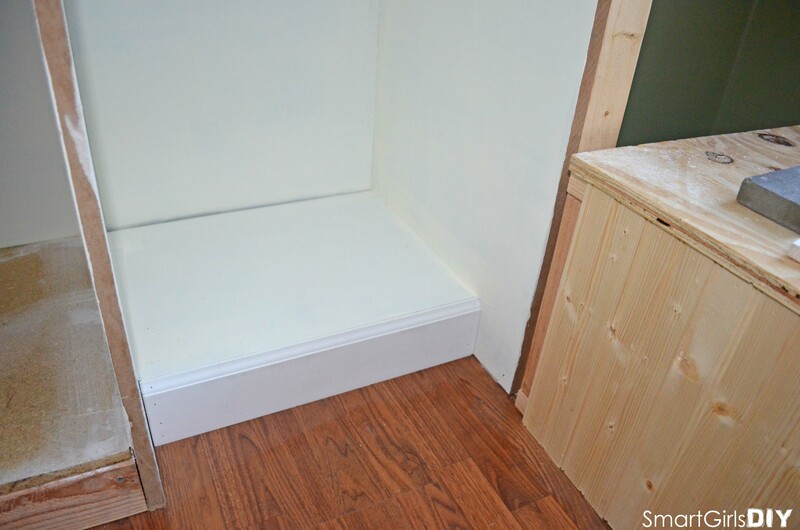 But no time to enjoy that victory, I had to finish up the window seat day bed from part 1. 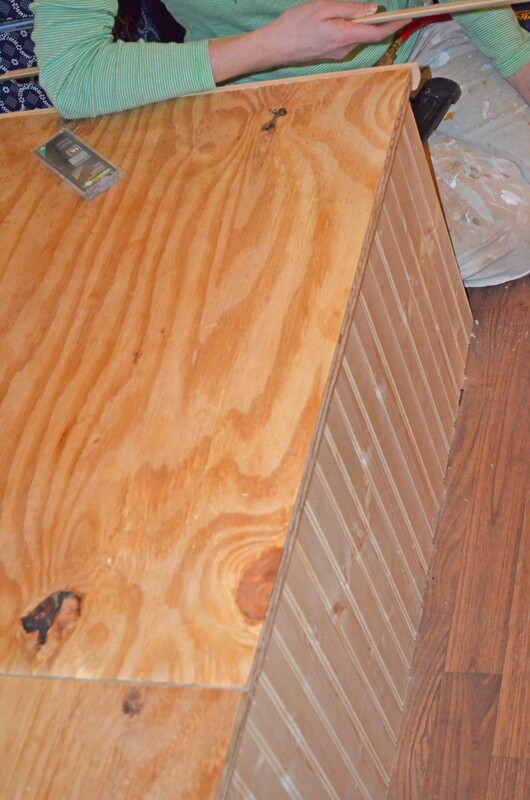 I added plank paneling to the side (I ran out and had to buy a 2nd pack), then added trim to the top. Hubby was nice enough to cut the trim for me because it was damn cold in the garage. The top trim is finished, but I need to get another piece from Lowe’s so I can do the bottom. And the left side/transition, still haven’t decided what I want there. 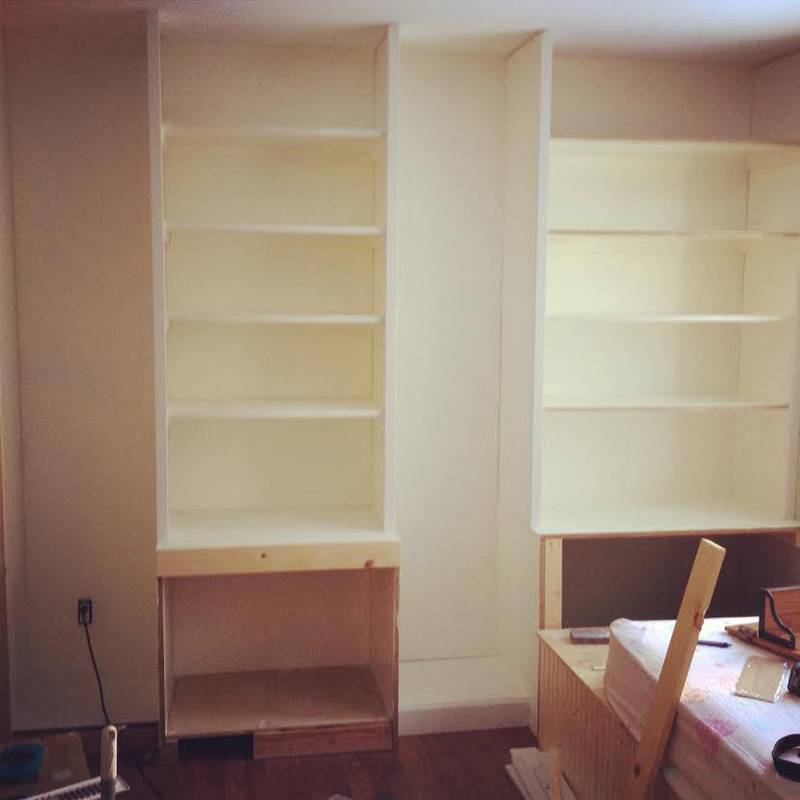 I added trim to the front of all 8 of the large shelves, but didn’t take any pics of that in progress. 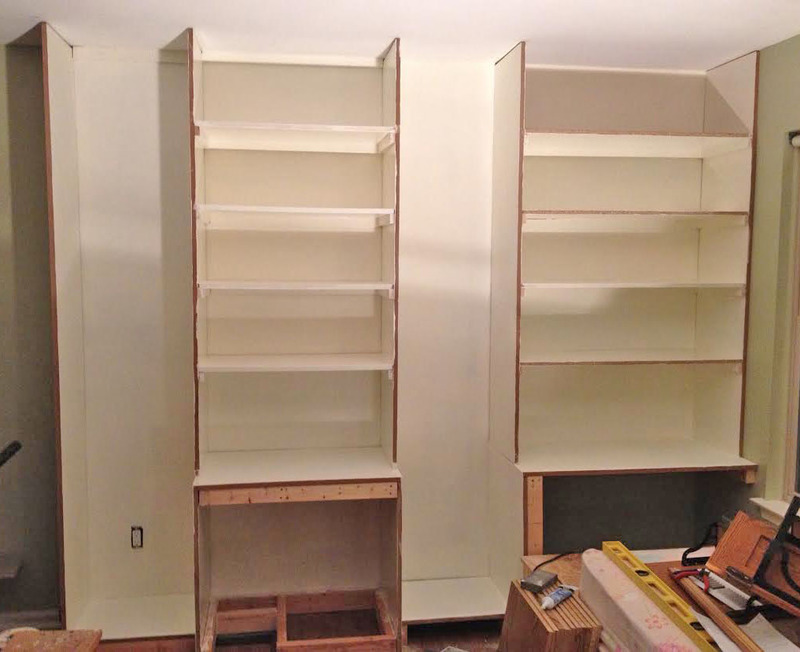 You’ll notice that the fronts of the shelves look much better now. 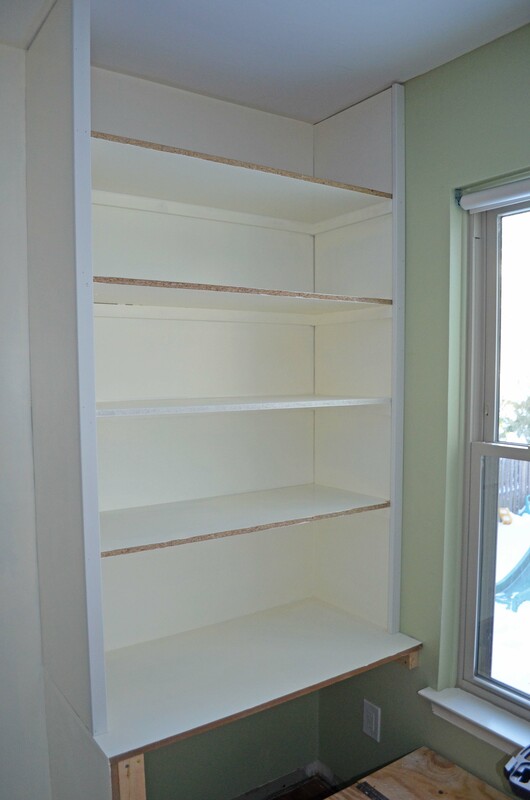 I cut some of my shelves from scrap “wood” from the original wall unit I bought off Craigslist, and the edges needed way more than paint. 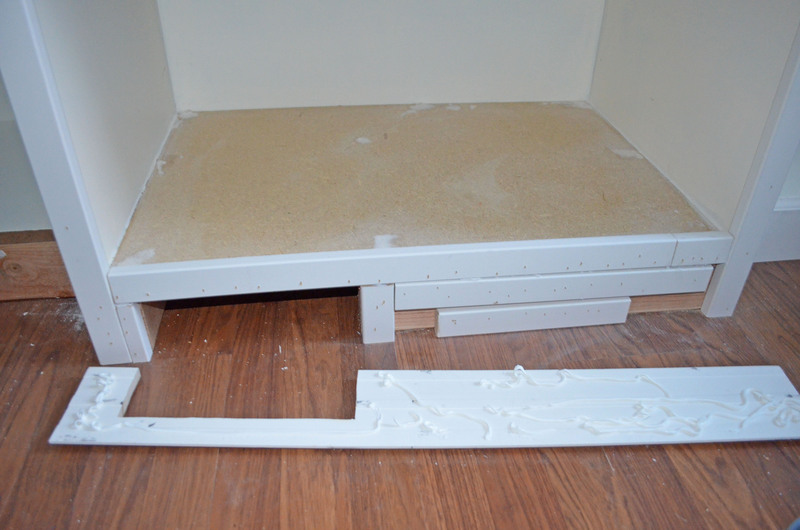 I also added a large piece of molding all the way across the top. 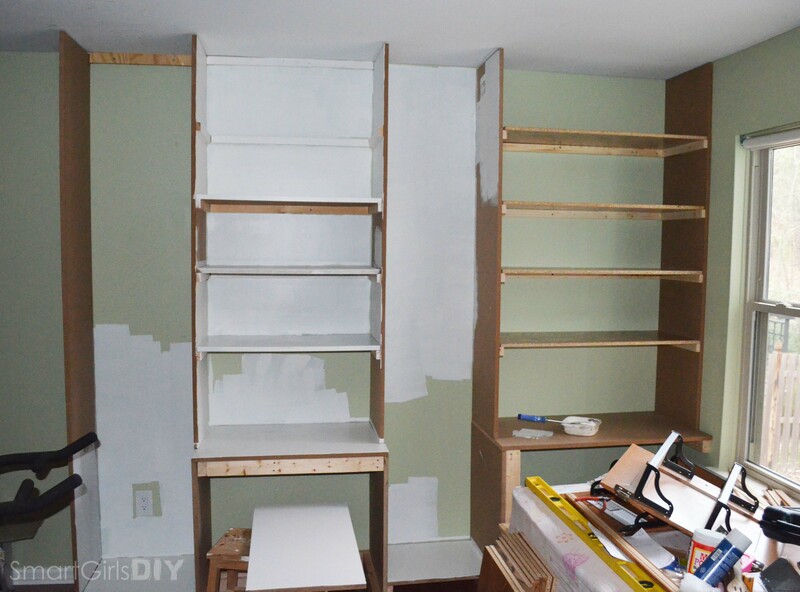 I painted the smaller shelves in my family room one night, finishing at 3am. I’ve only attached the ones on the left so far, the ones on the right need to be trimmed. Boo. 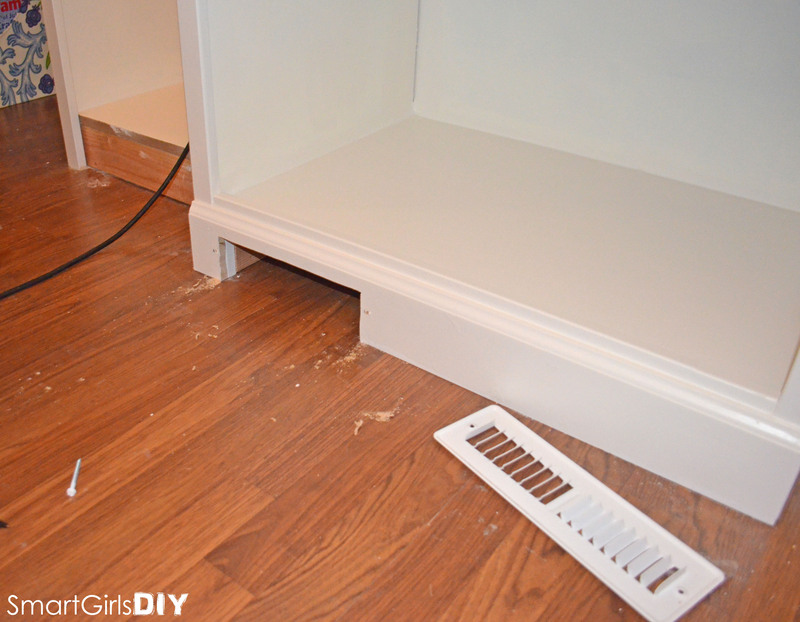 Here’s a tip for installing adjustable shelves — if you want to make different height options for your shelf pins, use a piece of peg board to mark the holes. 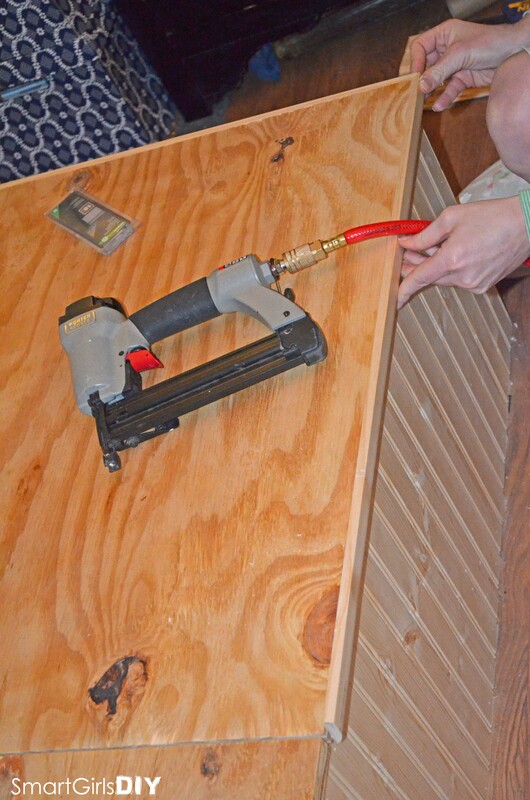 I circled the holes I used first, then drilled right through the pegboard. It’s hard to see through the pegboard to see your hole, that’s why I mark it on the pegboard. This way all my holes are in a nice straight line and all 4 pins are level. So that brings me to where I am now. Still not finished, but getting there. 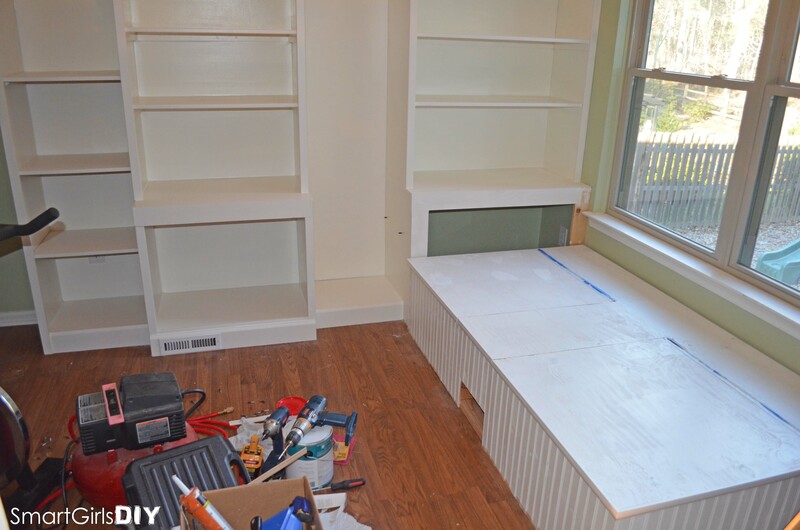 I can’t wait to be totally finished so I can load all my junk onto those nice, deep shelves. 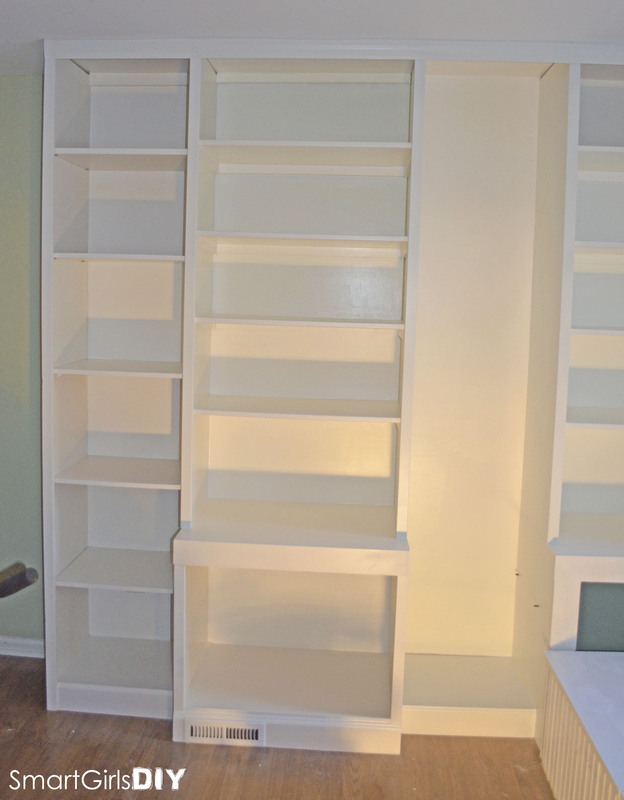 The paint on the shelves is still curing, and then I’m going to seal them. And CLEAN OUT MY OFFICE! What crazy, never-ending project have you taken on recently?